Family businesses have always been in fashion – in every sense of the word. One only has to walk down a European street to see institutions of all kinds that are still standing due to their dynastic nature, from laundrettes to department stores, where there’s often a warmth that larger corporations can lack. In the last century alone, small family-owned clothing and textile firms have grown into multi-billion pound empires. Surnames such as Versace, Missoni, Dior, Fendi, and Lauren have become more recognisable as monolithic brands than individuals, adding to the mythology that la famiglia is the best ethos to build a fashion house upon. But where are today’s dynasties and who are the families behind them? 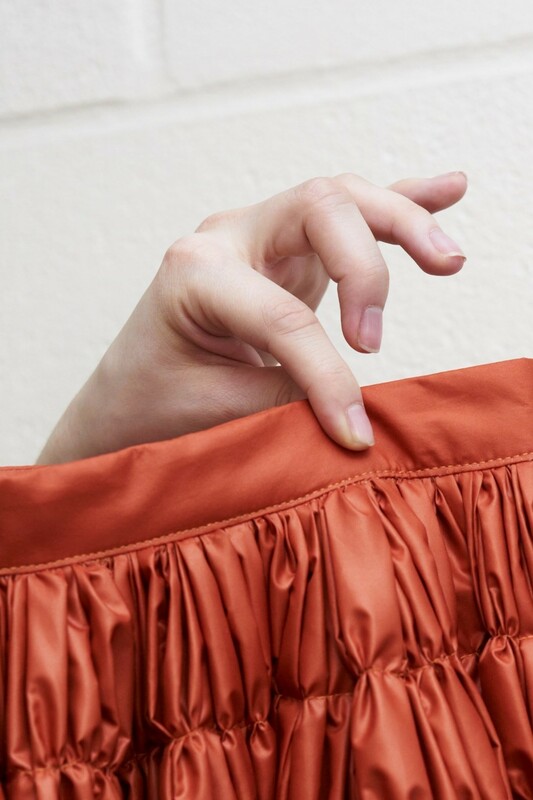 AnOther spotlights three 21st century labels that hold family values close to their core: Molly Goddard, Simone Rocha and Vetements. “I came from a family that was in fashion and that worked together, so it was extremely natural – our normality, in a way,” says Simone Rocha. As the daughter of Ireland’s most famous fashion duo, John and Odette Rocha, it’s fair to say that fashion is in Simone Rocha’s blood. A young Simone cut her teeth helping in her parents’ Dublin studio, working on handcrafts for the runway collections and eventually helping with fittings and running orders. Despite a brief flirtation with fine art, the magnetic pull of her formative years proved far too strong, and the designer found herself in the MA Fashion studios at Central Saint Martins under the tutelage of Professor Louise Wilson. Today, she works with her mother Odette, who looks after production and distribution, and her brother Max, who runs a record label and creates the soundtracks to Rocha’s London Fashion Week shows. “Fortunately and unfortunately, my work life and personal life are one big massive blob,” she says. Odette, who worked as her husband’s creative partner for over 25 years, jumped ship from Dublin to London’s De Beauvoir when Rocha Snr. shuttered his business in 2014. “It has rejuvenated me,” she says of joining her daughter’s studio, before adding that the difference between John and Simone is that “Simone often says no”. Since Odette came on board, Simone Rocha (the brand) has become one of the world’s most distinctive luxury ready-to-wear labels. “Once I started working with Mum, it grew into the company it is today,” explains Simone. 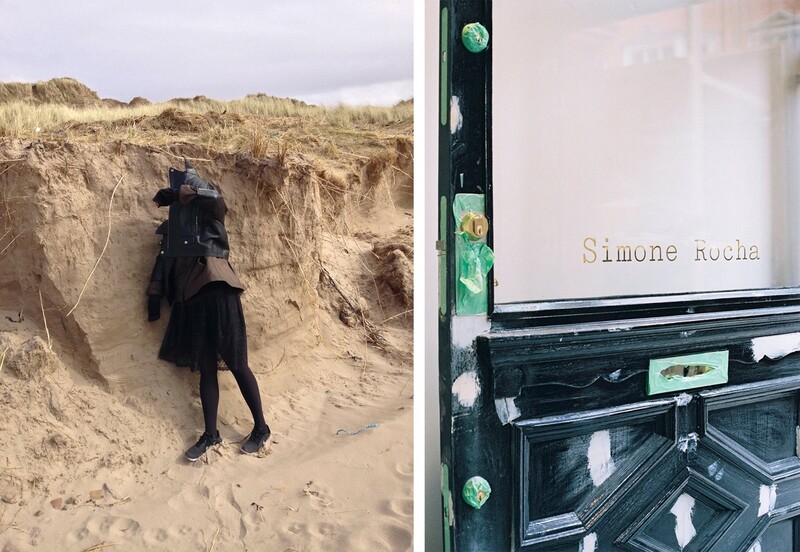 “Her and my dad built an amazing independent business and it’s been great modelling it on that, but my mum understands that it’s moving and changing all the time and very different to how they used to do it.” Simone cites working with her family (John weighs in on strategy and helped design the label’s Mount St. boutique) as the main reason she has been able to remain independent. “You’re not coming up against a challenge that is someone else’s priority, we’re all on the same page,” she explains, before listing Comme des Garçons, Rick Owens and Dries van Noten as family-run businesses that she admires. She also considers her mother an invaluable creative sounding board. “If it’s just me, a 29-year-old girl, then it won’t be a femininity that women of all ages can relate to. Her style and sensibility comes into that. I always look to her opinion as to how the garment should be finished or appear at retail.” It’s the run up to the bi-annual show, though, that has everyone mucking in. “Dad is usually away fishing so he misses out on it, but I get my boyfriend, who’s a director of photography, to come in for the lighting tests, and everyone is there to help.” What’s the Rocha family secret to making it work? “It has its advantages and disadvantages,” says Odette. “It’s a collaborative process and overall it means that you have somebody by your side that always has your best interests at heart. The fashion business is unlike any other, so ideally your relation has the relevant experience.” That, the Rochas have plenty of. Molly Goddard the label was born in Molly Goddard the person’s parents’ spare bedroom. 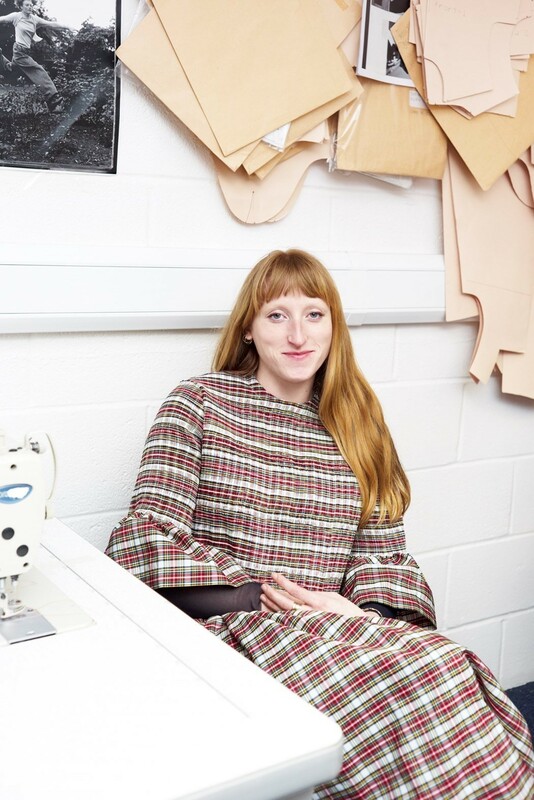 Having just finished her MA at Central Saint Martins in 2014, she spent the summer working on a collection of smocked dresses, and cobbled together a presentation at a central London church, which saw her friends modelling her creations and the atmosphere akin to a grown-up tea party. “I just wanted to hang out with my friends and family, which I hadn’t done in a long time because I had been on the MA and had been working really hard,” she explains. “It was a case of everyone mucking in and helping out and then it all happened so quickly and we were growing so fast and I didn’t have enough time find people to help.” The solution was simple: Molly enlisted the help of her family, who she continues to collaborate with today. Along with her boyfriend, Tom, who looks after the business side of the label, there’s her little sister, Alice, who styles the collections and helps with research; mum, Sarah, a former teacher who works on the sets; and dad, Mark, who helps with the installations that Goddard has been tasked with creating for her loyal stockists, such as Dover Street Market. Both brothers have experience working for megabrands before launching their “baby” – Guram worked on the business side of Burberry and Demna worked in the design studio of Louis Vuitton. They enlisted their father, who was retiring at the time, to manage their warehouse in Germany. “He’s super OCD,” says Guram. “I asked him to look after it and to make sure things are organised, and we went there and it’s the type of place you want to live. It’s so perfect.” When they first launched the label, which Guram insists has been profitable from day one, several department stores and PR agencies turned them down. “We still work with the people that supported us from the beginning and family is important for us,” explains Guram. “When you speak to Tom and Ruth Chapman from MatchesFashion.com, you know they care so much and so differently about everything they do. 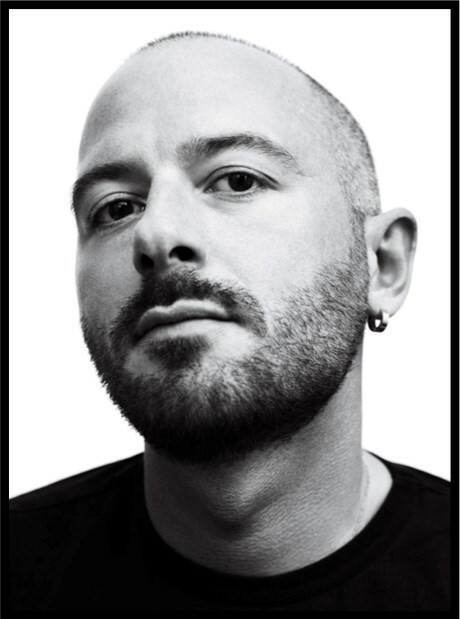 It’s the same with SSENSE, which was started by three brothers in Canada.” The difference between working with family businesses and more corporate structures is consistency, according to Guram. “With bigger stores, the buyers are changing all the time. Everyone has their own role and title and they come to the showroom to play that role.” The Gvasalias, however, insist that in their company everyone contributes at every step of the way, from going to the warehouse to dispatch orders to stockists, to dancing the night away at the label’s infamous after-show parties.